After some time ago we discussed the unique artwork of a Canadian artist named Dan Tanembaum which made of wristwatch parts. 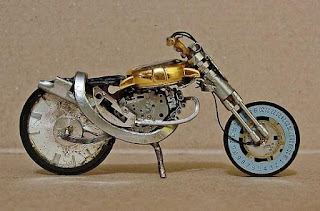 And it turned out a talented Brazilian artist named José Geraldo Reis Pfau also create beautiful miniature motorcycle uses components from old watches and used glasses. Pfau's passion with motorcycles began in the 1960s. He has various types of motorcycles, some of them changed and inspired by the "Easy Rider" movie. 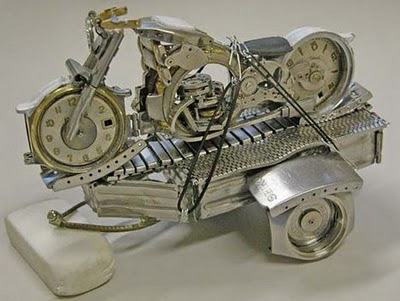 But the artist who was born and raised in Blumenau, Santa Catarina was also fascinated by the beauty of art, because that's armed with a natural artistic talent and passion, then he made motorcycle from a combination of unusual materials through a unique project. 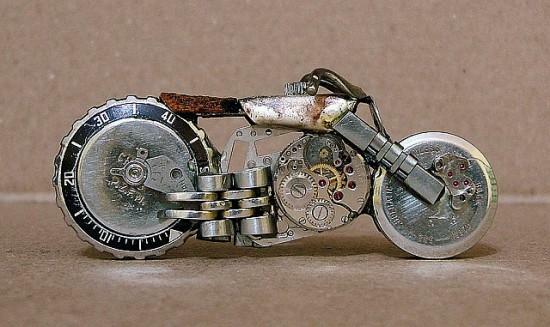 At first, he developed several images of motorcycles, but after reading about the artist who created the miniature motorcycle from wood, pottery, wire and other materials, he decided to create the same work of art, but using completely different materials ie from old watches. The pieces of wristwatches were the inspiration sources of his unique creations collected through a shop's advertising campaigns. 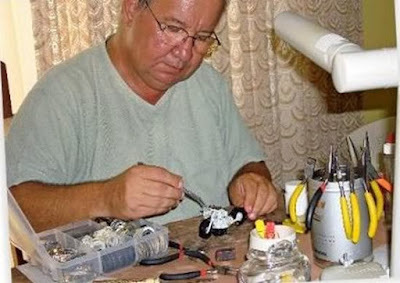 Alexandre Ranieri Peters, a personal friend of his and the shop owner created a campaign where whoever wanted to buy a new watch or a pair of glasses could give their old ones as a first instalment. 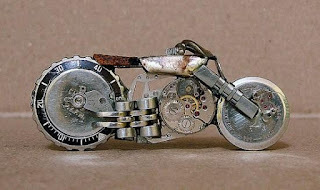 This then provides the raw materials required to experiment and create a unique motorcycle of wristwatches. Although Pfau only creates his artwork during the weekend, but he has a collection of hundreds of miniature motorcycles are specially made from old watches. 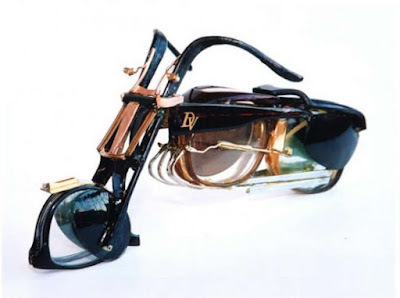 In addition to making a miniature motorcycle with the use of the wristwatch parts, Pfau also managed to create the same miniatures of the parts of used glasses. In the beginning the pieces were applied on wood frames to be hung on walls. They then became three-dimensional pieces, developing into sculptures. 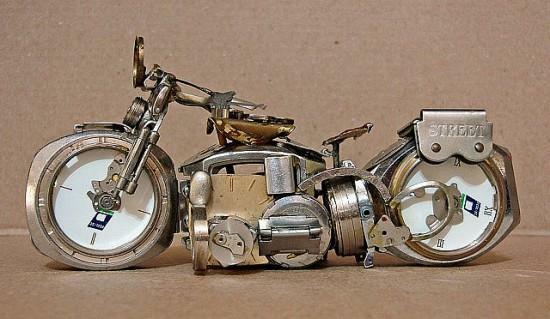 These miniature motorcycles look very much real. 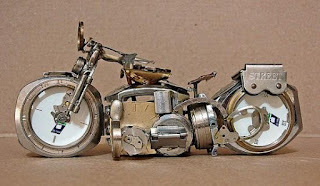 Metal, glass, aluminium plastic, silver and even gold pieces are put together, creating very different forms. 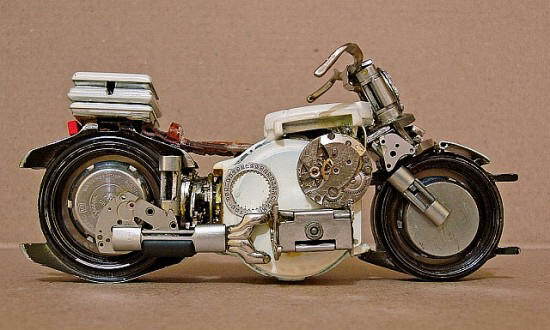 All of miniature motorcycles were his personal collection and they are not for sale yet, but he hopes to be able to sell them in the future. 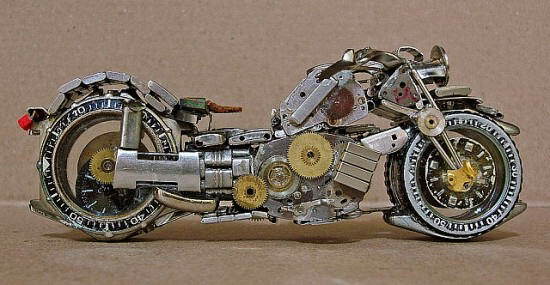 He owns more them 200 motorcycle miniatures at the moment. 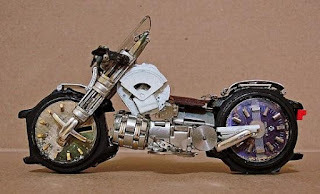 These small, unique, artistic and beautiful motorcycle replicas have been exposed to the public in the art and jewelry exhibitions throughout the major Brazilian cities and several other countries.